Chrome plated bar adjusts to fit most standard width door frames from 24″ to 36″ wide. The weight capacity for the bar alone is 300 lbs, so teenagers and adults can do chin-ups too! The weight capacity for the trapeze bar and gym rings combo and belt swing is 200 lbs. 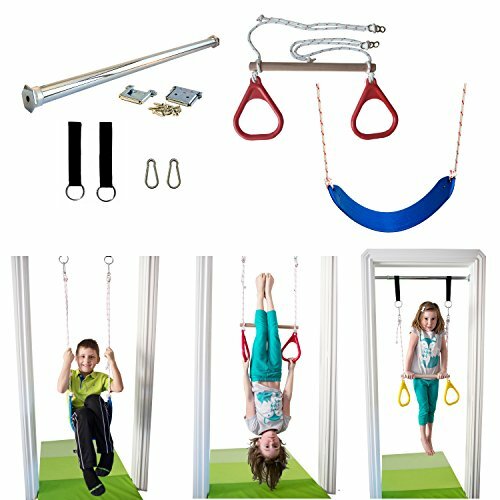 - trapeze bar with gymnastic rings combo. IMPORTANT: do not use a disk swing or any other accessory that rotates freely to avoid bumping into door frame. Safe. Easy to install. Fits door frames 24″-36″ wide. Assembled in Canada. Weight capacity 200 lbs. Recommended age 3+. Includes trapeze bar & gymnastic rings combo and rope swing.